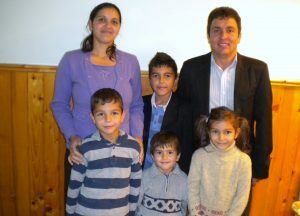 The Bordea family, Lucian and Carmen and their four children Ionut, Alex, Ana, and Iosif, have had the opportunity of being involved in ministry in Fundulea, Florica, and Ojasca. Lucian has served as a deacon at Hope Baptist Church for many years, and in 2010 God put on their hearts to devote more time to ministry. They have since worked with summer camp ministries and have seen the Lord grow a new fellowship in the neighboring town of Florica through evangelistic outreaches there. They appreciate all of the encouragement and support given to them while serving the Lord in Romania. Pray for enabling for the Bordea family as they serve with various summer camps and that many young people will come to know the Lord and give their lives to Him. The church construction project in Florica has been completed and Lucian Bordea is serving as the pastor there. The services are well attended by people from the village and from folks traveling to the village to attend. Please continue to pray for the church.